To be expected, I woke up Sunday morning with sore legs, but nothing too bad. 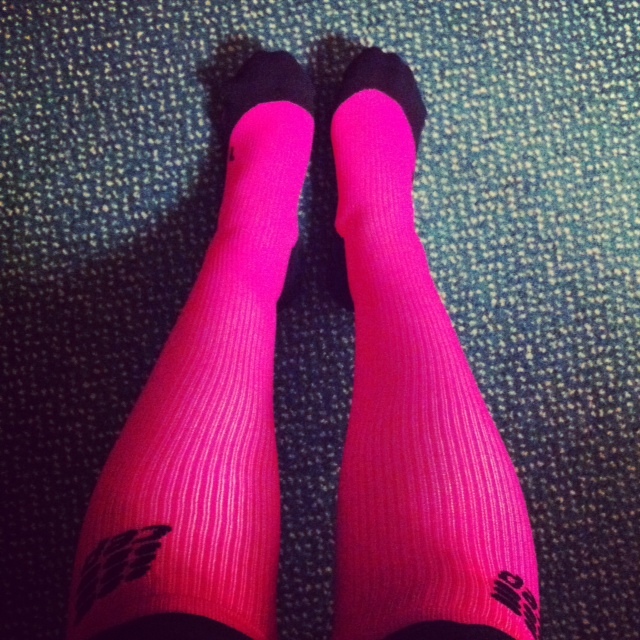 I made sure to put on my compression socks right after the race on Saturday and pretty much wore them the entire day. I’ll do a post soon on specific recovery techniques that have helped me run long doubles. I actually felt worse after the first day at Wonderland, so I knew I would be able to get out and do another 50K. 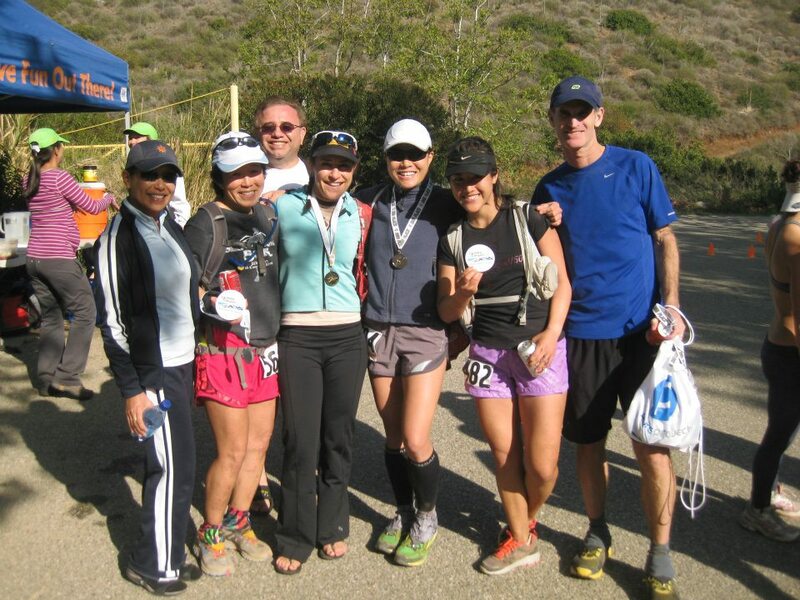 The race started the same place as the day before at La Jolla Canyon in Point Mugu, but it was a different course. My goal again was to take it easy and just finish, but of course I started off in the front going out way too fast. Once we started climbing, like a half mile in, I already felt winded and tired so I decided to back off for a bit and let some runners pass. We climbed up to Pt. Mugu overlook as we did the day before, but this time it was a complete 7.5 mile loop before we came back to the Start area where the aid station was. We headed up the Ray Miller trail (the same trail I came down the day before). This was a 2.5 mile straight gradual climb up to the top. It’s not so fun anymore when you are going the other direction instead of coming down the trail. 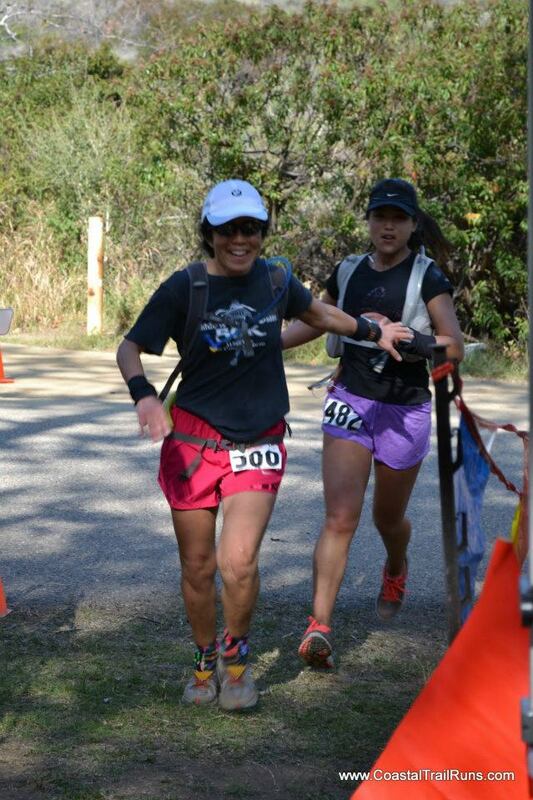 I had been going back and forth with this older runner who had really great running form on the technical downhills. He was a strong hiker on the ups so he would always pass me, but then I would catch up on the flats or downhill. He passed me going up Ray Miller and I said I’ll see him at the top. 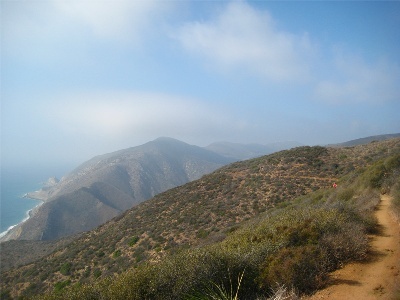 Once we reached the top, we started going downhill on Sycamore Canyon Fireroad which was a nice open fireroad where I caught up to my friend Meg who I was also yo-yoing with on the ups and downs that day. 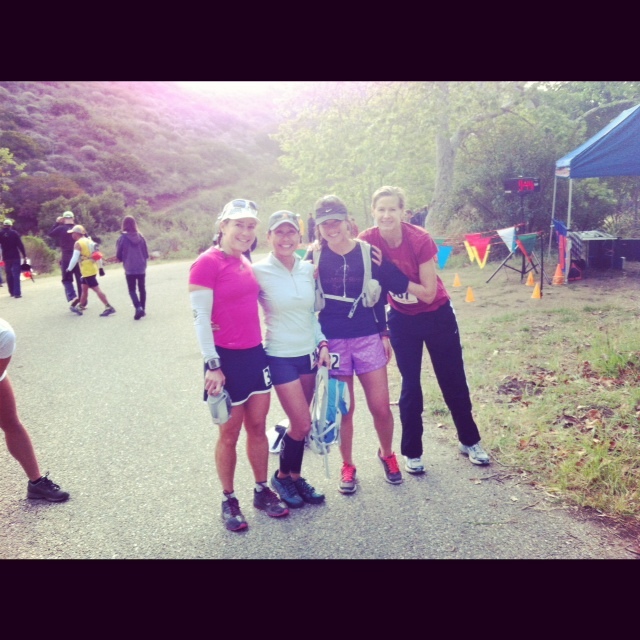 Once we reached the bottom of the hill, we came across our next aid station. This was actually where I got lost and ran to the previous day! Stopped to chat with the nice volunteers who commented on my Ray Miller 50/50 shirt and headed up the Fireline trail. Having done this trail the day before, I knew it would be a straight 1 mile climb up switchbacks before we reached the top. I was feeling better during this race going up Fireline because it was only 15 miles in whereas the day before, we were almost 26-27 miles in. At the top of Ray Miller, it was a straight shot downhill before we got back to the Start area. I was feeling good so I picked up the pace on this 2.5 mile stretch. A runner who just happened to be out there, not part of the race, was riding my tail all the way down. I turned around and asked her three times if she wanted to pass, no answer. She had music blasting in her ears and couldn’t hear me even though I was right in front of her. PSA: please do not blast music on the trails to the point where you can’t hear what is going on around you. It is dangerous to you and to the other runners. I always have my ipod with me on long runs, but most of the time it isn’t even on, and if it is, I only have one earbud in with the music turned down low. That’s what the trails are for, you don’t really need music. When we got back to the Start area, I caught up to Meg again and was hoping to do some of the 2nd loop with her, but she left me pretty early on in the 2nd loop once we started climbing. I was feeling a bit grumpy this time around because I had already done this loop already and the heavy mileage was really starting to weigh on my legs. A lot of times I just pulled off the side of the trail and just stopped to breathe and relax. It felt better not moving for a little bit before continuing on. 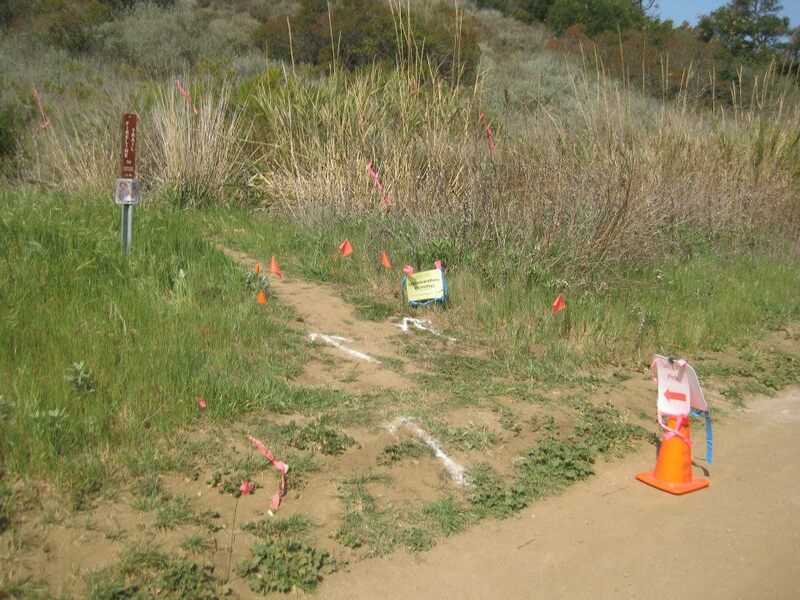 This 2nd loop was pretty desolate as most runners were doing the shorter distances. 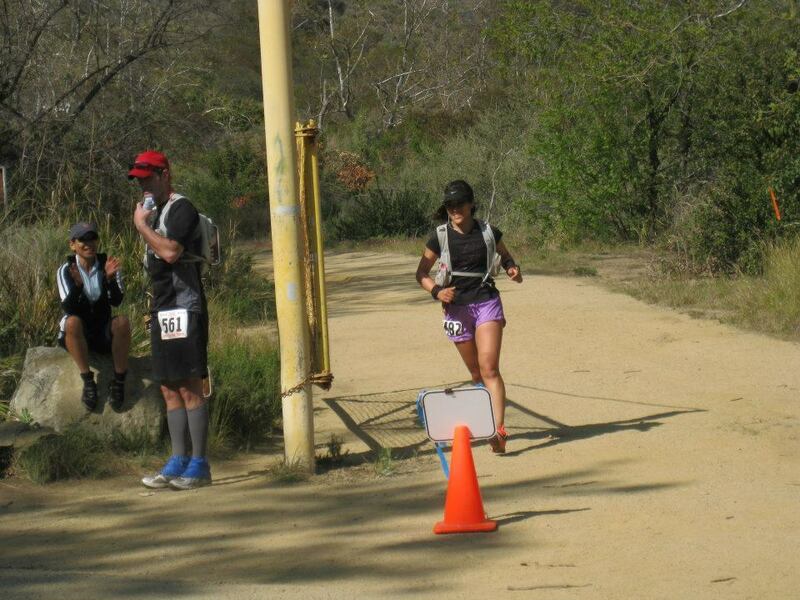 The 2nd loop ended at mile 26 before we had one more climb before the finish. Up the Ray Miller trail again for the 2nd time of the day. I actually went up this trail faster than the 1st time. I was just ready for this race to be over and since I knew this was the only climb left, I didn’t have to save my legs for anything. I power hiked/ran the ups until we reached the turnaound. 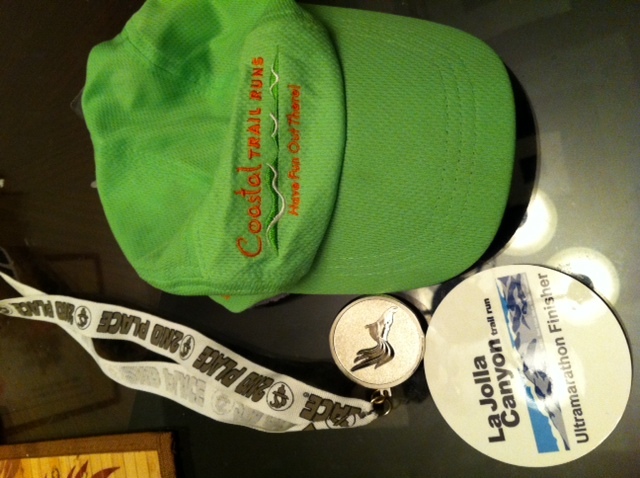 The race director had heard I did the Ray Miller 50K the day before and decided to throw in a nice hat for me. Bling!